Cars and trucks have been slowed to a crawl since August 14 on the National Expressway 110, which is also known as the G110, the major route from Beijing to Zhangjiakou, Xinhua News reported. Officials expect the congestion to continue until workers complete construction projects on September 13, the report said. State media reported that Chinese drivers have become accustomed to the severe delays, noting a similar jam in July that slowed traffic for close to a month. Britain's Sky News reported that the snarls have been commonplace since May as a result of a spike in the number of trucks using the roads, with the daily peak reaching about 17,000. 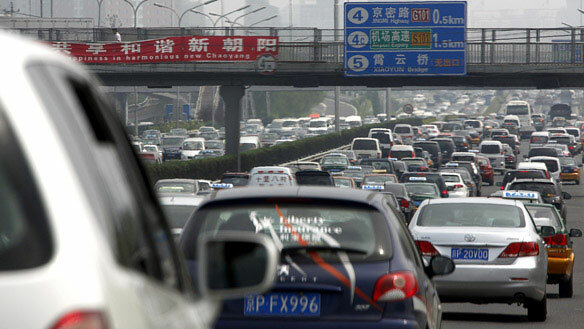 "Insufficient traffic capacity on the National Expressway 110 caused by maintenance construction since August 19 is the major cause of the congestion," a Beijing Traffic Management Bureau spokesman told the Global Times. Chinese national radio reported Sunday that minor traffic accidents and broken-down vehicles have complicated the traffic mess, Xinhua reported. Approximately 400 police officers are patrolling the road 24 hours a day in an effort to keep the situation calm, Sky News said. Motorists have taken to card games or chess to pass the time, Sky News reported. Others joked that "concerts should be held at each congested area every weekend, to alleviate drivers' homesickness," the report said. Residents from communities alongside the expressway have seen opportunity in the traffic slowdown, setting up food and drink kiosks for the drivers. Some drivers have complained of price gouging. One truck driver, identified by his last name Huang, told the Global Times that "instant noodles are sold at four times the original price while I wait in the congestion. "Not only the congestion annoys me, but also those vendors," he added.